The budget is a massive attack on students and university education. It rips $2.8 billion over four years out of universities across Australia. Student fees are set to increase by 7.5 per cent over four years. When fully implemented, students will pay between $2000 and $3600 more for a four-year course. Students already face fees of $6152 to $10,266 a year. An increasing share of the cost of degrees is being shifted onto students, with fees to cover 46 per cent of the cost of degrees, up from 42 per cent now. Student fees have increased by almost half since 1997. Worse, the Liberal Party is reducing the HECS repayment threshold from $55,875 to $42,000. This means students will have to start repaying HECS on an income not far above the minimum wage. On top of job insecurity, cuts to penalty rates and the housing crisis this is another kick in the guts to students and young people. In a continuation of the government’s anti-immigrant offensive, New Zealand citizens living in Australia and permanent residents have also been targeted. They will now have to pay full fees instead of HECS, at a cost of $90,000-$100,000 for a three year degree. Combined with the three-year increase in the wait to gain citizenship, this will stop people from studying. 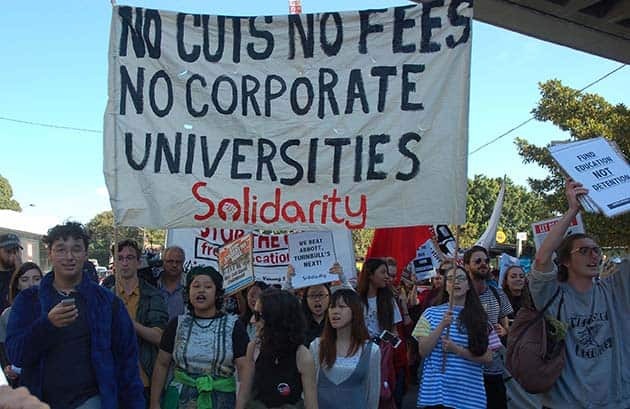 Universities have already suffered funding cuts of $3.9 billion over the past six years, according to Universities Australia. Yet Education Minister Simon Birmingham claims that funding has, “grown above and beyond the costs of their operations” since most universities aren’t actually running at a loss. That is because they have been slashing jobs and casualising staff for years. Managements increasingly run universities like corporations as they move to cut costs and enrol more and more students in an effort to rake in funding. Even in the last few months, Victoria University has announced 115 academic job cuts, Curtin University said around 150 jobs would go, and UNSW planning documents revealed up to 400 administration staff would lose their jobs. Over half of teaching at Australian universities is now performed by casual staff. Many are only paid for teaching periods, around half the year, and have to scramble to renew contracts from one semester to the next. Administrative and teaching staff have been forced to take on more responsibilities and are often overworked. Universities are trying to find even more ways to reduce contact hours, with some courses at Melbourne University such as creative writing replacing lectures with online recordings of last year’s course. The new round of cuts will come in the form of an “efficiency dividend” of 2.5 per cent in 2018 and another 2.5 per cent in 2019. Large universities like University of Western Sydney, Sydney University and Melbourne University will lose around $45 million. Melbourne University estimates it will suffer a cut of $150 million over four years, including other measures. There will be further pain if universities do not meet new performance targets, including in course completion and research. These would trigger funding cuts of anything up to an enormous 7.5 per cent. Universities that cater to students from lower income and working class backgrounds such as Victoria University or Charles Sturt, which have higher dropout rates, face greatest risk. University Vice-Chancellors have already indicated they will be unable to absorb the cuts, meaning staff will be cut and the quality of education will further decline. The Government attempts to justify these measures by saying they need to balance the budget. But the priorities and interests of the Liberals are clear. Corporate tax cuts will cost the budget $5.2 billion over the next four years. This is a budget for the Liberal corporate elites and wealthy while students and the poor pay. Australia is already one of the lowest in the OECD club of rich nations for public funding of tertiary education as a proportion of the economy. We need to fight this attack on students and staff. Abbott proposed complete deregulation of university fees which would have allowed universities to charge whatever they liked. The scale of the protests and opposition forced the Senate to block this, and the Liberals to abandon the plans. This shows that protests work. We need to demand the Senate does the same thing again. Students are not consumers, and universities shouldn’t be corporations. We need to fight for universities to be institutions for social need and public good. This starts with stopping Turnbull’s cuts through mass pressure and demanding universities get the public funding they need.